Mountains are important in Māori tradition, but there are few accounts of them being climbed. However, the Ngāti Tūwharetoa people have a story about Ngātoroirangi climbing Mt Tongariro. Ngātoroirangi was a high priest who arrived on the Arawa canoe. He left Maketū, where the canoe landed, to seek land in the interior. On his journey he climbed Tauhara, near Lake Taupō, and seeing Mt Tongariro was determined to climb that mountain too. To forestall the claims of another inhabitant, he called forth snow and sleet, but when these arrived they almost cost him his life. Reaching the summit tired and cold, he claimed the land below for his descendants and then summoned three baskets of fire to warm himself. Only one basket reached him, and he threw it into the side of the mountain. The place where it landed is Ketetahi (‘one basket’). 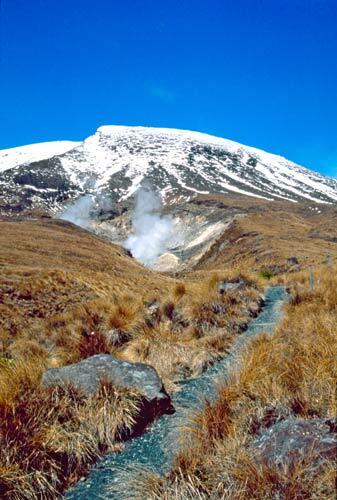 Ketetahi Springs can be seen steaming on the slopes of Mt Tongariro.